The Scheinman Institute on Conflict Resolution provides unique mediator training opportunities. These intensive two-day workshops are held at the ILR Conference Center on the Ithaca campus in the days prior to both the fall and spring semesters. Over several years, the program has included several expert trainers from around the country including Daniel Rainey, Chief of Staff at the National Mediation Board; Diane Rosen, NYC Attorney and Commercial Mediator; Richard Fincher, AZ Labor and Employment Arbitrator and Mediatior; and, Jeff Shepardson, Director of Training and Facilitation, CDRC of Ithaca, NY. The training has also expanded to includes students across campus, including students from the ILR School, the Law School, the Johnson School, the Hotel School, the College of Human Ecology, the College of Arts and Sciences, and others. 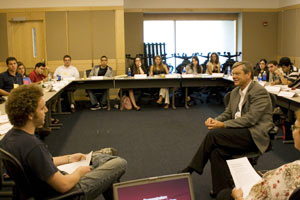 Starting in 2008, the first program, exclusively for Cornell ILR School and Cornell Law School students, was led by Phoenix, AZ-based mediator Richard Fincher; Diane Rosen, a New York City attorney and mediator who also serves as Program Advisor; and mediator Rocco Scanza, the Executive Director of the Scheinman Institute. Course content included detailed discussions and group exercises on such varied topics as campus conflicts, workplace terminations, and securities investor/brokerage disputes. Students also participated in several simulation exercises to give them experience applying their mediation skills to real-life situations. For additional information regarding these programs, or to register for this free training, please contact Traci Morse at tlm6@cornell.edu, 607.255.9298. The student mediation training achieved its goal of sparking interest in mediation and conflict resolution. The program was great and taught me how to better my own relationships and resolve conflicts. In just three days, I learned practical skills that I will be able to use professionally. (The most important aspect was) Learning about the substantive steps of mediation and having the chance to practice following the steps in the simulations. The training actually exceeded my expectations. I did not expect to learn as much as I did. I really liked how personalized this program felt. The instructors called us by name. There are a lot of people skills – including tone and body language – required of mediators. I learned skills that are valuable in any situation I would encounter in the workplace. Negotiations positions are usually fronts for underlying issues. Probe for those, that's where the resolutions come.